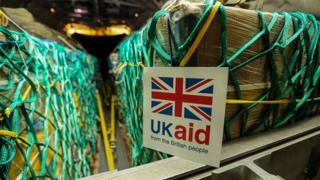 Plans to require future governments to honour an overseas aid spending target are on the verge of becoming law in a move welcomed by campaign groups. The International Development (Official Development Assistance Target) Bill had already been passed by MPs. The government backed the bill but opponents say it is "gesture politics". The proposed legislation is likely to receive its Royal Assent in the coming days. Both the coalition government and its Labour predecessor committed the UK to meeting the UN-inspired aspiration on overseas aid but the bill will bind all future governments. The private members bill was originally tabled by former Scottish Secretary Michael Moore in the Commons and taken through the Lords by Lib Dem peer Lord Purvis. "If we can help others take these simple things for granted as we do here, we will be making a worthwhile contribution," he said. Save the Children said the passage of the bill was an "historic decision" which would save millions of lives across the world while Oxfam said it showed the UK was serious about continuing to protect the aid budget and the "vital lifeline" it provided. Some Conservative MPs and peers have said the bill will shackle future governments at a time when unprotected departmental budgets - including defence - are set to face a severe squeeze on spending during the next Parliament.